PITTSBURGH—With the support of faculty and staff, more than 4,000 University of Pittsburgh students will roll up their sleeves to participate in the fourth annual Pitt Make a Difference Day (PMADD) from 9 a.m. to 4 p.m. Oct. 22 in Oakland and surrounding communities, with check-in beginning at 8:30 a.m. in the William Pitt Union, 3959 Fifth Ave., Oakland. Pitt students will be dispersed to more than 68 different sites and will work with local partnering groups—Habitat for Humanity, Tree Pittsburgh, Living Ministry, and the AIDS Task Force—to assist with such service tasks as cleaning up local neighborhoods, planting trees and gardens, painting, and assisting at food banks. This year, PMADD will occur on the same day as National Make a Difference Day. The Pitt Student Government Board created PMADD with support from the Division of Student Affairs. Modeled after the National Make a Difference Day, PMADD provides an opportunity for Pitt students to enhance their roles as leaders in communitywide volunteerism and service, foster collaboration across student organizations, unify the Oakland campus, and inspire Pitt Pride. Partnering groups—Dunkin Donuts, Pamela’s, and Eat & Park Hospitality Group—will provide refreshments to students and staff participating in the service activities. PMADD participants also will receive community-service credit towards their Outside the Classroom Curriculum transcript. For more information on Pitt Make a Difference Day, contact Shawn Ahearn at 412-648-1005 or Ahearn@pitt.edu. University of Pittsburgh news reps are available to answer urgent media inquiries. Outside of regular business hours (Mon-Fri, 8:30 a.m.-5 p.m.), please call 412-225-6384. 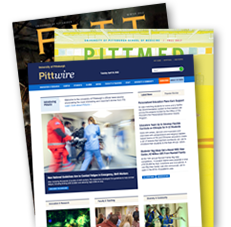 News reps for University of Pittsburgh Health Sciences schools can be reached outside of regular business hours through the paging operator at 412-647-2345.